If you’ve been planning a visit to my beautiful state, Vermont, the weekend of March 24th and 25th would be a great time to come. Vermont’s maple festivities will be in full swing with Open House Weekend. Open House Weekend is a public celebration of the maple season in Vermont and most sugar maker’s open their property to the public to sample, observe, and delight in the maple syrup process. As anyone who reads my personal blog knows I have a deep love for maple and use it constantly in cooking! 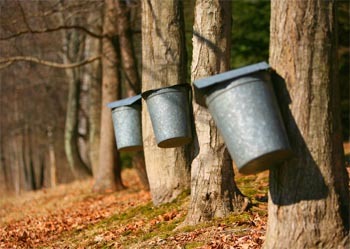 A great resource for events going on over the weekend is the Official Website for Vermont Maple Syrup. This site offers a clickable county-by-county feature to look at events. In my own county, Lamoille County, I recommend several events in the Cambridge VT area. Boyden Valley Winery is holding a Maple Sugar Festival. This event will include family friendly activities, a wood-fired evaporator demonstration, a tour of a working family farm, winery tours, and of course lots of tasting! Heading directly across the street to Brown & Jenkins, a local Vermont gourmet coffee roaster, you can follow up the wine tasting with a cup of maple-flavored coffee, maple infused locally baked goods, and a variety of made in Vermont items including handmade fudge from Maple City Candy and maple sugar from Palmer’s Sugar House. If you continue on into Jeffersonville (home of Smuggler’s Notch) you can swing into the Vermont Maple Outlet or go to Lasting Spring Maple Farm for their open house complete with coloring book activities for kids. You can grab lunch at The Mix Cafe in Jeffersonville which according to Vermont Life has the best french toast in Vermont. I can definitely concur on this- it is delicious. End the day at Smuggler’s Notch for some afternoon skiing and head to Three Mountain Lodge for a family-friendly meal. Learn to love maple! Nasreen Stump is a freelance writer who lives in Vermont, when she isn’t on the road for work. Find food recipes and Vermont life at her website ramblingstump.blogspot.com. Check her out on Twitter @ramblingstump . Next Post: Summer in Ft. Lauderdale? Why Not?